Truly a gift of distinction, our V.I.P. 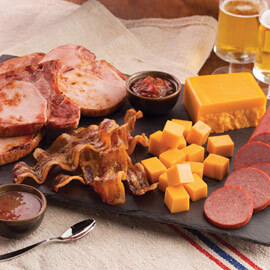 Special is loaded with a terrific assortment of delicious meats and cheeses...perfect for hors d'oeuvres. A perennial gift favorite year after year. I ordered several of these as Christmas gifts this year. Everyone loved them-so much so that I wonder why I hadn't done all my shopping at Amana Meat Shop before! Due to issues with UPS in North Carolina over the holidays, two packages intended for me never arrived. No problem -- a quick phone call -- Amana Meat Shop replaced both of them without quibble. My family has enjoyed Amana Meat Shop for decades. You will not find a tastier product nor better customer service. 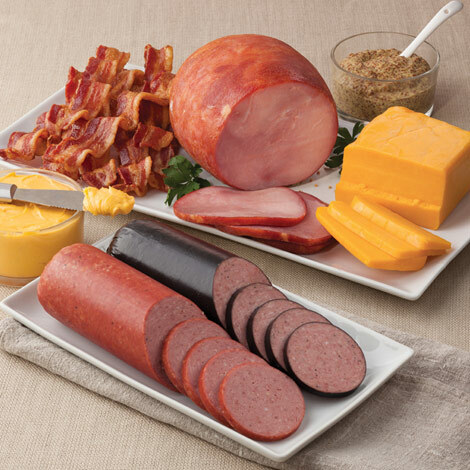 For over a decade, we've ordered a special package of the quality products offered by the Amana Meat Shop. It's always been delivered on time and provides everything the family enjoys for our traditional Christmas Breakfast. This year I incorrectly addressed the package...but the good folks at Amana caught the error, called me and made the correction. Well Done! Thank You. The tradition continues. This was an excellent gift for me to give to those hard to shop for people. 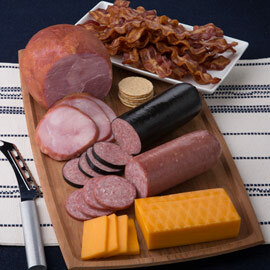 The quality of the meats are top notch, the items arrived well packaged and the gifts were greatly appreciated. They arrived quickly, stored appropriately and packaged well. Great value for the money . I gave as gifts and everyone thrilled... Will definitely order again . I regularly send these gift packages to family for Christmas. They really enjoy them and deliveries are always done timely and well. Excellent service, shipping, and of course, very tasty! Due to a delivery issue (not Amana's fault) I had to replace a lost package. Excellent service on the replacement - thank you Amana! I ordered the VIP Special for my sister and her husband. They love it, especially the bacon! Received a gift of your meats at Christmas and was so impressed with the value and the meats I ordered for my granddaughter and received back how much they loved the meats. Gave as a gift . They loved a taste from home!! Can't go wrong with an Amana Oak. Sent as a gift. Recipient was completely surprised, thrilled and impressed with the package. This gift box is one of the best, although there are no bad ones from Amana. The ham is perfect, the bacon is great and the sausages top notch. Bought this package as a gift for my parents. They loved it. The meat was excellent. They especially liked the ham. This was ordered as a gift to a family member. They told us it was good and they enjoyed it. Shipped quickly. Amana products make great gifts, year after year. Family and friends receiving Amana products at Christmas are always thrilled, and look forward to the enjoyment of the fine selection of items. Former Iowa City residents. Top quality meats, restaurants, and woolen sweaters. Sent as a gift so I did not see it in person. The photograph and the description of the products led me to order it as a gift. The bacon and ham was very good. Did not like the sausage and cheese. Recipients were delighted with selection and quality! I sent this for a Christmas gift. My cousin was delighted with it. I will definitely remember Amana Meats in the future. We love your ribs, pork chops and stuffed pork chops. Each year I purchase gift boxes from your store. Locally produced and prized, made in America, and quality worth its reputationI Amana Strong! Amana Response: Thank you, Lynn! We appreciate you! This is a great gift set. I bought 2, 1 was a gift & the other I kept. Everything is delicious. I will give this again for sure. I made 26 separate orders mailed to addresses all over the USA. Thanks for doing such a fabulous job!! Wonderful gift for a family gift. Gift was very well received. Our summer sausages and ham are fully cooked and ready to eat. The ham is very lean and great for slicing for sandwiches or snacking. Can gently reheat to serve warm. Cook bacon before eating. Cheese is ready for snacking anytime. 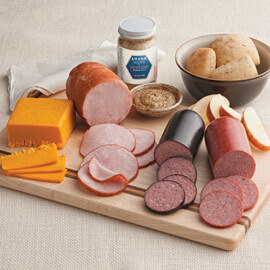 Tip: This ham, cheese and summer sausages are more flavorful when served at room temperature.